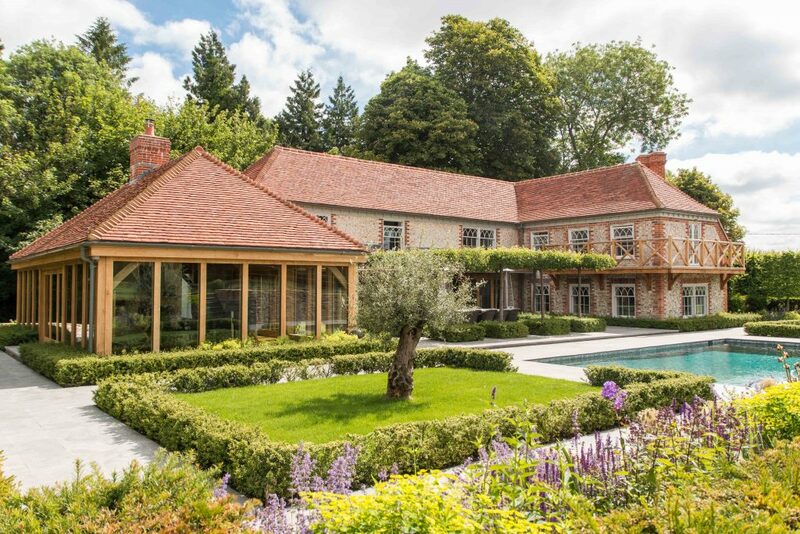 Following on for an extensive refurbishment and extension of the house, swimming pool and energy Canal, PC Landscapes won the tender to provide landscape construction in Winchester. This included complete re-grading of the ground, new stone walls, limestone paving, garden steps with integrated lighting, hot tub and orchard. Oak timber bridges were installed over the energy canal, along with a new oak jetty in the pond. The installation of a fully automatic irrigation system, with a buried reservoir tank ensures the planting gets the water it needs. Drip irrigation to the planting beds, trees and hedges, with pop-up sprinklers on the lower lawns. The garden is divided into areas by the planting of pleached hornbeam trees and yew hedges. Additional drainage was added under the trees and hedges, due to the property being close to the ground water level from nearby stream & pond. Rainwater runoff from higher, surrounding fields had to be considered. Communication was vital between client, designer and builders. Using our extensive knowledge and practical skills, close collaboration resulted in resolving all issues that arose. As a result, we managed to achieve the clients desired results, effectively managing expectations throughout the project. We are pleased to announce we have won a BALI Award for this project.